Demand for Chateau Grand Traverse’s cherry wine continues to explode in China. After exporting more than 1,500 cases over the past 18 months, the Traverse City-based winery says it hopes to dramatically increase that number to 8,000 to 10,000 cases by the year’s end. China represents less than 2 percent of the Chateau Grand Traverse’s annual production volume of 110,000 cases, or 1.3 million bottles, with shipments taking place every three to four months. Based on feedback from the company’s export broker, however, O’Keefe says the winery may soon be sending about 700 cases every two months. “The demand for our cherry wine product will continue to grow in the coming year and we will most likely need to expand our production significantly on this particular item,” O’Keefe says. Most recently, Chateau Grand Traverse shipped 300 cases of the cherry wine to China for the annual Chinese New Year celebration, which starts in mid-February. This marks the fifth commercial wine order that the company has shipped to China in recent years as part of its ongoing export-marketing program. Considering that cherries were not as affected as the state’s grapes were by the extreme cold weather last winter, O’Keefe says now is the time to expand the winery’s cherry wine marketing efforts. 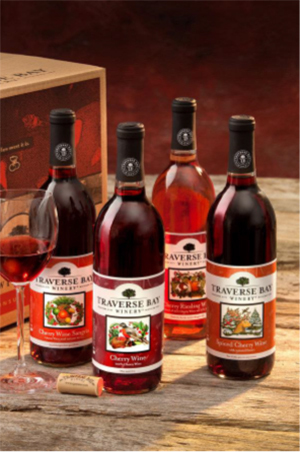 The Traverse Bay Winery brand, which also includes cherry Riesling wine, cherry wine sangria, and spiced cherry wine, is sold in stores throughout 10 states and is available for sale online in 16 states.